That’s a common refrain from many owners of stainless steel appliances. 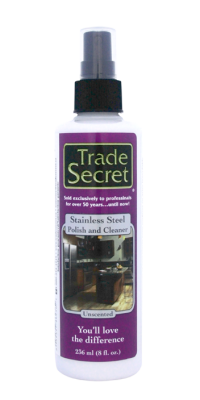 The fact that Trade Secret Stainless Steel Polish & Cleaner was originally formulated for staff at appliance retails stores explains why people might feel that way. Designed to remove fingerprints, surface marks and dirt, it is an excellent regular treatment that is simply spray and wipe. No dry time or harsh solvents, just a deep streak-free lustre. Make your kitchen look like a showroom…but without the pushy salespeople!